Ethan Miller/GettyDo you own gun stocks? Investors are scrutinizing their ownership of gun stocks following the mass shooting in Parkland, Florida. Passive index funds, which power many retirement plans, are the largest shareholders in America’s three major gunmakers, according to Morningstar. About two out of every three dollars invested in small-cap funds have exposure to gun stocks, Morningstar found. The three gunmakers are small-cap stocks (companies with a total market value of roughly $US300 million to $US2 billion). 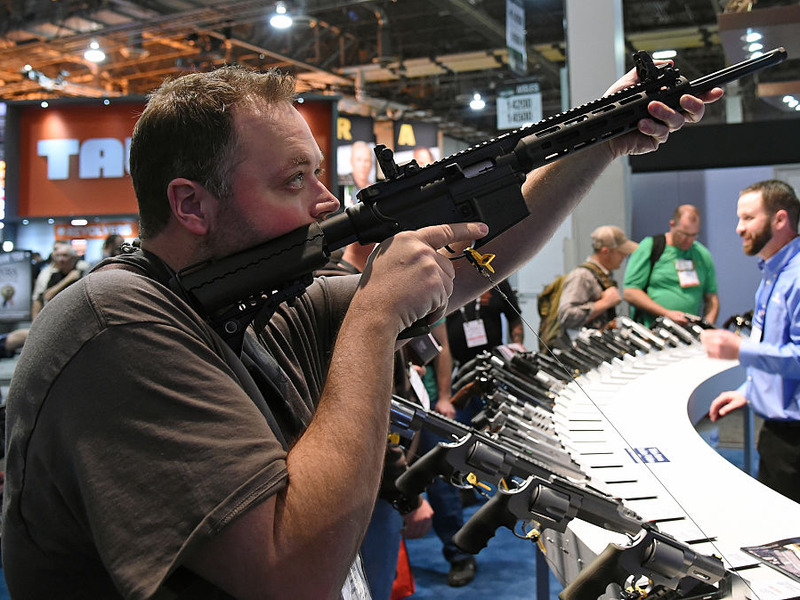 Morningstar has published a long list of funds that own any of the three gun manufacturers. Investors are scrutinizing their ownership of gun stocks following the mass shooting in Parkland, Florida on February 14. BlackRock, the world’s largest asset manager, said Friday it was exploring ways to offer index funds – single investment products that simultaneously buy several stocks – that exclude gun manufacturers and retailers. American Outdoor Brands, formerly known as Smith & Wesson, manufactured the semi-automatic AR-15 assault rifle used in the mass shooting at Marjory Stoneman Douglas High School, police said. “We share the nation’s grief over this incomprehensible and senseless loss of life and we share the desire to make our community safer,” James Debney, the company’s CEO, said during the third-quarter earnings call on Thursday. Investor scrutiny centres around so-called environmental, social, and governance (or ESG) guidelines, which factor in a company’s impact beyond profit making. Other issues that have prompted these kinds of discussions include climate change and gender diversity. Last week, Morningstar released a guide to help people check if the index funds that manage their retirement plans own any gun stocks. Index funds invest massive amounts of money at a time, so they could end up among the largest shareholders in companies they buy – especially since many of the companies aren’t that big. 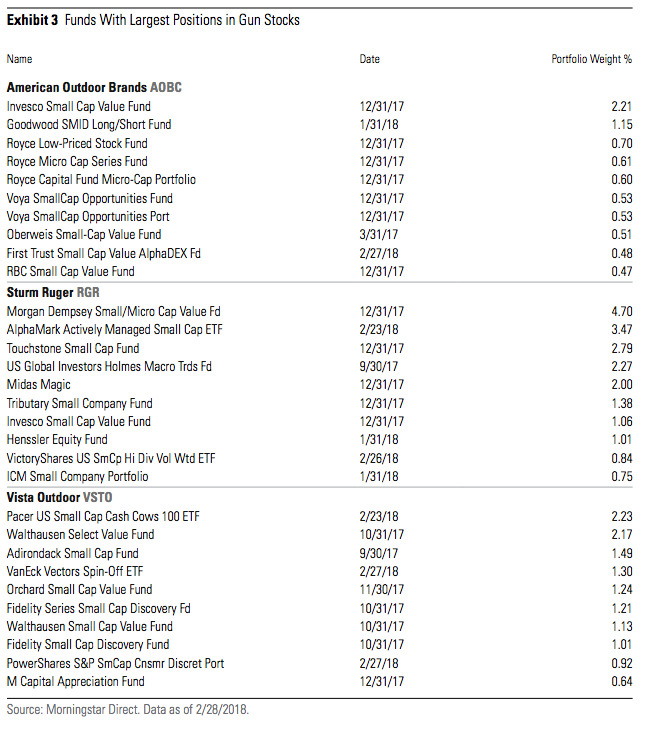 For example, Morningstar noted that the $US700 billion Vanguard Total Stock Market Index put 0.01% of its assets in American Outdoor Brands. But that investment adds up to a 2.4% stake in the company. The first step is to log into your account and check whether the mutual fund that runs your 401-k is exposed to small-cap stocks. That’s because the three major gunmakers – American Outdoor Brands, Sturm Ruger, and Vista Outdoor, fall under this category of companies with a total market value of roughly $US300 million to $US2 billion. “Driven by assets in index funds, approximately two out of every three dollars invested in small-cap funds have exposure to guns,” said Jon Hale, Morningstar’s director of sustainable-investing research. Apart from small-cap funds, those that have a broad exposure to the total stock market are also likely to include gun stocks, Hale said. 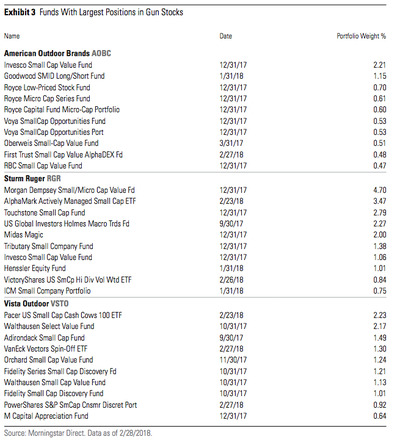 The one category of index funds that’s least likely to be invested in gun stocks is actively managed small-cap funds. That’s because only some portfolio managers are likely to select gun stocks given the thousands of companies they can choose from, Hale said.